I’ve spent quite a bit of time trying to find some software to do flight mapping for the UAV, so I can avoid writing it myself. 🙂 Unfortunately, I just can’t find anything that’s free, let alone cross-platform. There’s certainly a few things out there, but they’re either just out of the question ($$$) or simply don’t work properly. Or are so simple that they’re not worth the effort – e.g. OziExplorer, which requires you to manually import maps and whatnot. And it’s expensive if you want actual 3D. 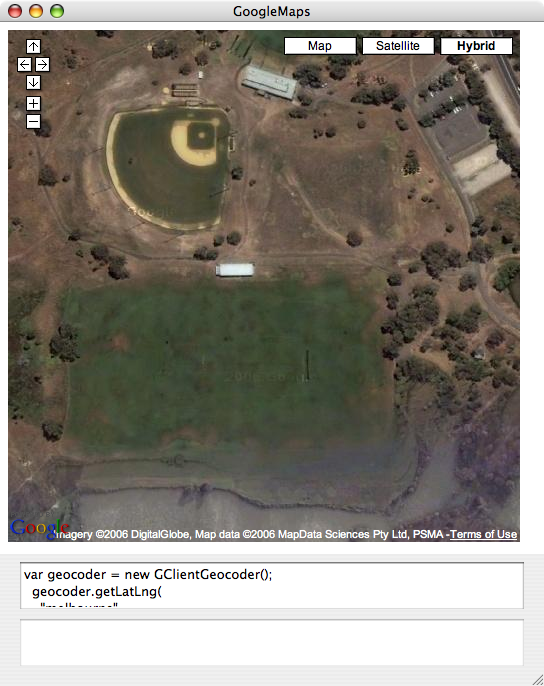 What would be nice would be to use Google Earth, perhaps with some plugins or whatnot. Sadly, the free version of Google Earth doesn’t let you draw paths or import GPS data. Even if you go right up to the $400-a-pop Pro version, there doesn’t seem to be any way to vary the altitude of points within the same path… so you’re just doing 2D mapping, which is trivial anyway. D’oh. So, I’ve begun hacking at the Google Maps AJAX API. At this point I’m ecstatic that we in MacOS-land have WebKit, which allowed me to get the basic mapping up and running in about 10 minutes, nine and a half of which were me causing exceptions because of my naive use of NSStrings (instead of NSURLs). Anyway, I’ve had some luck poking at it. The API of course doesn’t really want you to thieve off with it’s images. Sure, you can, but aligning them with their GPS co-ords isn’t entirely trivial. And getting the exact one you want, given a lat/long, isn’t straight-forward either. I’ve also been trying to figure out if I can determine the lat/long from the index myself… while I seem to have gotten the longitude correct, it seems the latitude isn’t linear… while I got the correct longitude for my test site, Stanford University, I ended up somewhere in the middle of Canada because the latitude was way off. I haven’t actually confirmed that it’s non-linear, but I don’t see any other explanation… if it were linear, to fit my results Google Maps would only cover plus/minus 60 degrees latitude, contrary to it’s very convincing appearance of covering the full 180. So I think it can be done, one way or another… but it’ll probably take a good day of coding just to implement all I’ve just described all-too-deceptively-succinctly in one paragraph, since the whole thing’s all asynchronous and I haven’t quite tested how I can actually get the images themselves (well, I can get the URLs, so presumably it’s just a matter of issuing a NSURLRequest in the worst case)… lots of work ahead, it seems. Previous Previous post: Could it be… too much… Starcraft?